For this shot I wanted to test the Canon 5D Mark II’s ability to capture a moment in time. 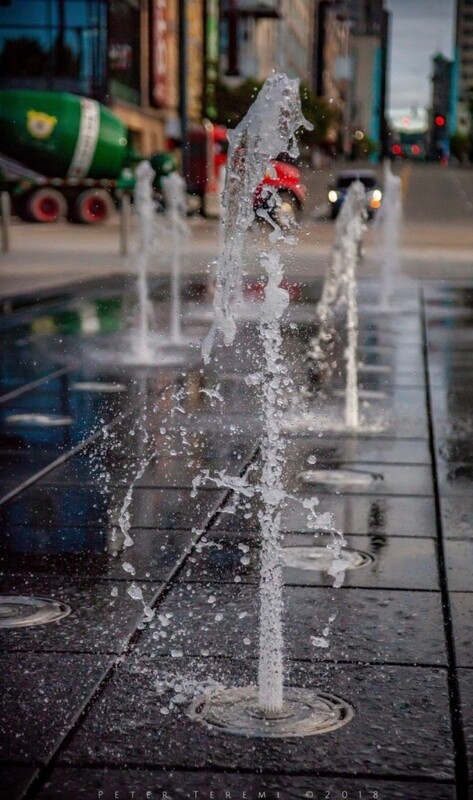 The Frozen Fountain, is one of the many fountains in Smale Park. It is not uncommon, on a warm summer afternoon, to see children splashing about, laughter pealing through the pitter patter of water droplets and little feet. This image was captured at sunrise. I used a shutter speed of 1/8000 sec to get the freeze frame I wanted. Zoom was set to 75mm, and aperture wide open at f4. There was not enough light to run a low ISO, so I pushed it out to 3200. I was extremely pleased with the low noise levels, and picked up some nice bokeh from the vehicles and traffic lights. I am having a lot of fun with this camera, and look forward to the next installment in the series. Thank you for viewing these. Thoughts and comments are welcome and appreciated. As always, Murphy and I wish you a happy day from The Murphy-Cam Project!